A set of 12 colouring pencils. These twelve full length, natural wooden colouring pencils come in a kraft paper tube. They are the perfect accompaniment to our colouring books. 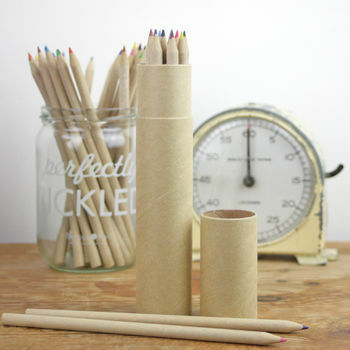 These pencils along with one of our colouring books would make a great gift for someone. The colours in the set are; red, pink, purple, light green, dark green, yellow, orange, light blue, dark blue, light brown, dark brown and black.